American Family Association: Don't Let Target's Arrogance Fool You, We've Cost Them Billions In Stock - Joe.My.God. Did you hear that? When asked about over 1.25 million people who are boycotting his store he shrugs it off and uses the word “handful.” Don’t let Target’s arrogance fool you. We are having an impact and the boycott is making a difference. 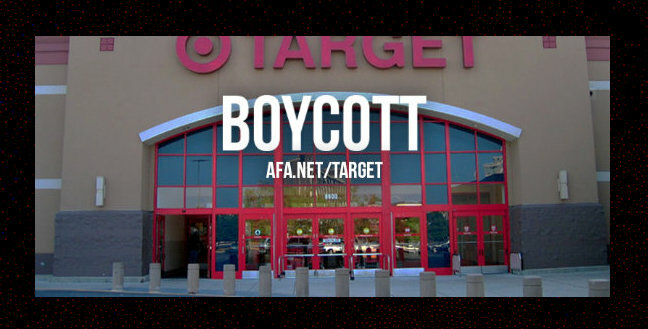 Since we launched the Boycott Target Pledge April 21, over 1.25 million people have signed on. Another interesting fact, Target has remained silent on Facebook and Twitter. The most recent post on Target’s Facebook page came April 23, and their Twitter has been silent since April 19. In comparison to other major retailers, Target’s stock has dropped three and four times more than the stock of its competitors. While there are many factors at play in the stock market, we do believe the boycott has played a role in the company’s public image and ultimate stock fall the past four weeks. I say all of that to say this; your efforts are making an impact. Urge everyone you know to sell their Target Stock.